I don’t know where to put this post – it isn’t a Monday Munchie, but it is a recipe… it isn’t a Tuesday Art Craft, but it leads to lots of crafting… AHA! It is a Life-Skill. If you do anything near kids, teach, mother, babysit whatever then you need to know how to make Play-Do. 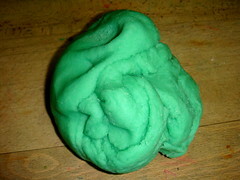 There are bazillions of play-do recipe’s out there but this is the one I use and is stuck in my brain. It is quick, easy and you can make heaps of it at a time. The replay value is brilliant, it lasts for months in a sealed container, and I mean months. And it is very cheap entertainment! Step 1: Measure the flour and cream of tartar into a bowl, ready to pour. 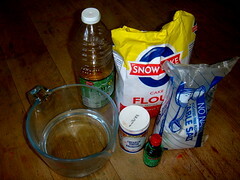 Step 2: Place the salt, water, oil and food coloring in a pot. Step 3: Heat the pot gently and stir all the time. Step 4: As soon as the pot boils pop the flour mixture in and stir the flour through. Step 5: You get a really lumpy bumpy mixture. Step 6: Now you knead it for about five minutes – I use my hefty machine! Step 7: Until it is smooth and silky. There you go: A surprise for the Hoods in the morning! This play-do is fabulous to use for making quick and easy juggling balls. Next Clearly Christmas: Se7en Gifts Kids Can Make For Adults. Funny, I also did a Play dough post this week! Thank you. I love the glitter idea – definitely a fun Christmas gift idea. I make the same playdo! Only, I use equal parts salt and flour and I don’t do steps. Just throw everything in the pot and stir on the stove till it comes together. Hi O, Thanks for the tip… if I don’t make play do this week I will be in serious trouble!!! Have a good day!